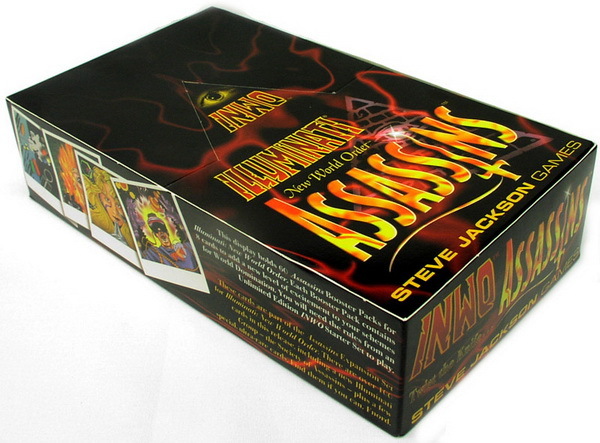 INWO Assassins: Twist the Knife . 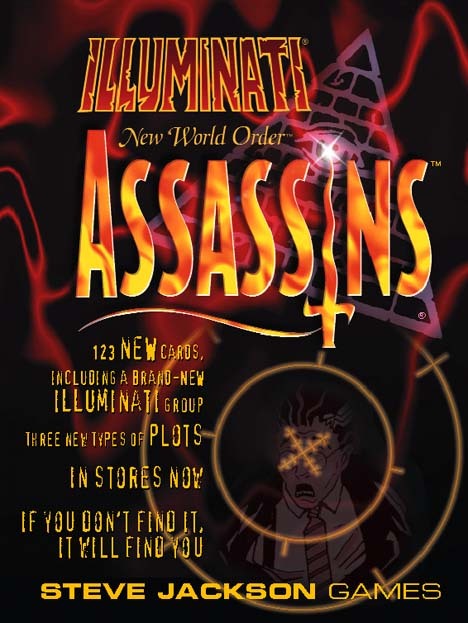 . .
A sinister NEW Illuminati: The Society of Assassins – They thrive on secrecy and fanaticism and you control them. Attribute Freeze – Freezes every card of a given attribute, preventing them from acting for the rest of the turn. Paralyze – Take a single card out of commission until countered. Zap – Affects another Illuminati group directly! 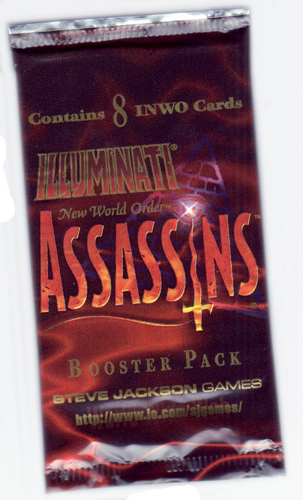 10 Ultra-Rare Cards: In one out of every ten Booster Packs, the Rare card has been replaced by one of ten Ultras . . . which we chose, not for their power, but for great art and general weirdness. Trade with your friends, or hoard them for yourself and gibber madly! Our spies report that some stores are out of Assassins. If sinister forces prevent you from getting this supplement, there are other sources available for our operatives. Not quite ready to trade? Afraid you'll accidentally trade off an Ultra-Rare for an Uncommon? Ignorance is dangerous, comrade. But reading this web site puts you on the Inside. Feast your eyes on these card lists with rarity. Fnord. 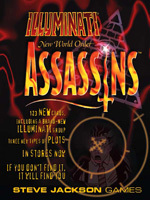 Read the Assassins Designer's Notes from Pyramid #18. Even the Secret Masters are not completely free from errata. Fortunately for us, we can blame it on enemy schemes. And fortunately for you, when we find errata, we let you know about it. Check out the current Assassins Errata.